Sure, Jesus may have fasted from bread for 40 days, but I have chosen to surrender the lunacy of incessant airwave banter. My wife is much appreciative, no longer startled whenever she turns the ignition and greeted by overly-opinionated male voices shouting about the viability of this trade, that off-the-field antic, or whether the Sixers will actually lose all of their remaining games. As for me, at roughly the mid-way point of this Lenten experiment, I admit a change in attitude and posture as I drive to work every morning without my cynical talk radio companions. The Lenten decision to replace jaded jargon about over-paid athletes with silence, prayer, and carefully-crafted playlists has transformed my morning and afternoon commutes into sacred spaces for intellectual rest. This time of year the liturgical calendar is trendy and fashionable. We wear our attempts to fast from chocolate, television, radio, desserts, or meat on Fridays as though they are badges of honor God will remember when we approach the pearly gates. Even more, we not-so-subtly hope others take notice when we decline a piece of cake or medium-well steak at a gathering among friends. We may take advantage of the 40-day pilgrimage, much like New Year's resolutions, to drop a few pounds or cultivate new habits to improve our health. While there is nothing wrong with the surrender of sweets or 97.5 The Fanatic during this journey to the cross, beware of missing this pertinent point. Lent is a solemn and confessional movement to Jerusalem whereby we die to ourselves and the ways in which we have missed the mark of God's dreams for us and the whole world. We acknowledge our brokenness and the fragility of the whole world that longs to be set free from suffering, sin, and death lurking around every corner. Lent is a season to ponder the ways we and others have robbed our fellow brothers and sisters, even the created world, of God's divine intentions. We cry out to God for forgiveness and healing, assured that just behind the crucifixion is an empty tomb. 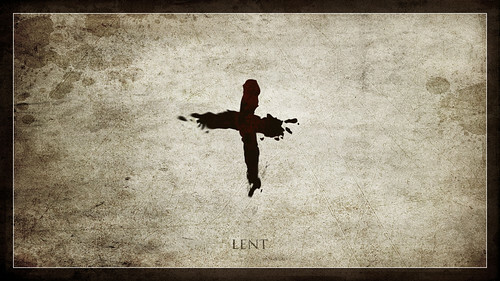 Lent is a prolonged beckoning for deliverance from the God who has a history of liberation. As we draw closer and closer to Good Friday and Holy Saturday, may whatever we give up for Lent be done with all this and more in mind. May we tune into the darkness of the human experience and the fractured nature of the world we call home, confident light is just over the horizon and newness of life will surely come. May our fasting from __________ and our repentance of _________ never assume an ability to earn favor with our peers or the God who made us. Instead, our surrendering transforms us personally so we are more faithful witnesses externally to the good news of Jesus who sends us beyond these 40 days of Lent. "In its non-concrete and non-historical aspect, sin is robbery, in the sense that it is the falling of [humanity] out of direct relationship with God, the rending asunder of the spiritual band which unites God with the world and with [humanity], the Creator with His creation. It is an assumption of independence in which God is forgotten...If, however, we begin with this aspect of sin, we have to take care lest, passing by the Cross, we suppose ourselves capable of undertaking the restoration of our proper position either by some forceful and tumultuous action or by some delicate refinement of thought."